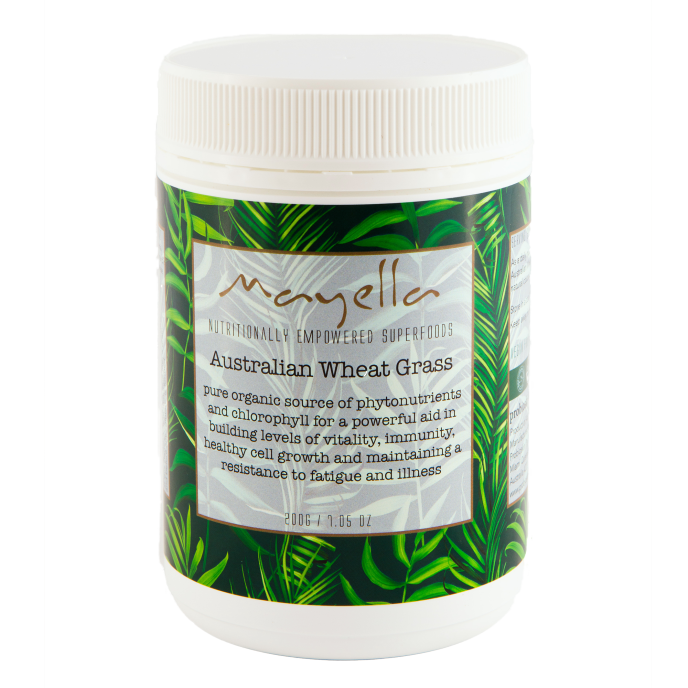 Consciously harvested to obtain optimal nutritional value, Mayella ® Australian Wheatgrass is an organic natural whole food and daily nutritional source that is highly recommended for general health amongst women, men, teens and children. A potent anti-inflammatory, Wheatgrass is calming to the gastrointestinal tract easing disgestive disorders such as ulcers and irritable bowel syndrome. 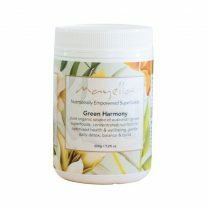 High levels of chlorophyll support natural lymphatic cleansing, with a skin deodorising benefit. Detoxifying and oxygenating our blood producing vital healthy blood cells. The young green shoots of wheat grass are harvested at their nutritional peak prior to maturing into wheat grain and before any “gluten” is formed. High in chlorophyll, stimulating tissue growth and repair with over 90 minerals vital for life. Selenium contained in wheatgrass is a powerful trace mineral and important in maintaining a resistance to disease, it is also known for increasing antibody production to strengthen the body’s ability to fight abnormal cell growth. 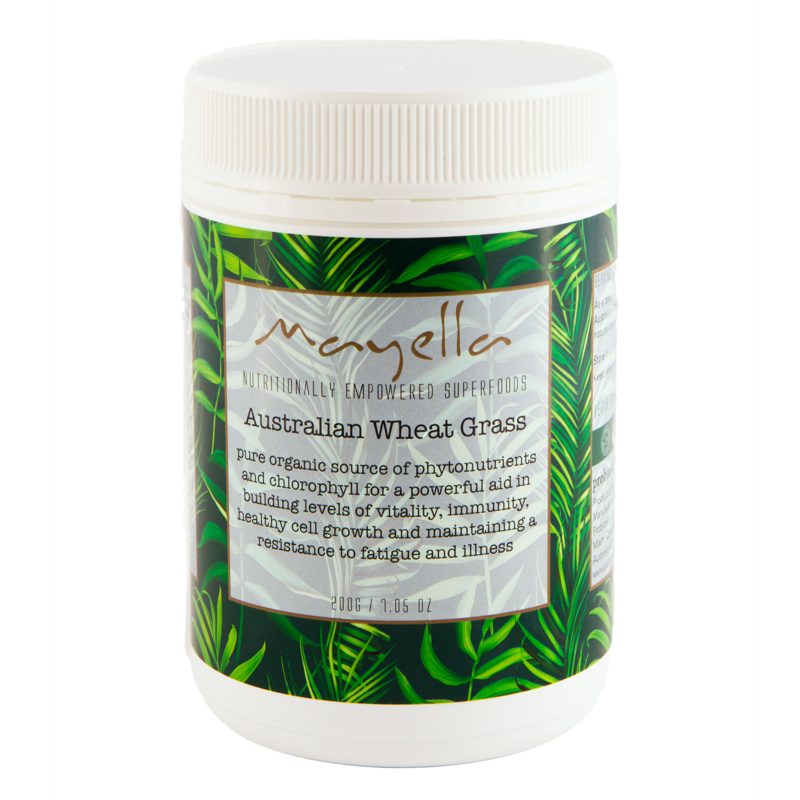 High in iron and a natural source of this essential mineral, assisting the body to transport and store oxygen in the blood and muscles and produce energy, daily supplementation with Mayella® Wheatgrass can help to maintain the immune system providing micronutrients essential for fatty acid metabolism, assisting the human body to detoxify and cleanse. 100% pure and organic Mayella ® Australian Organic Wheatgrass capsules are the perfect travel companion! Take your daily immune system boost with you to help your body to stay strong with exposure to different germs/foods/jet lag/ dehydration/different time zones. While some people prefer adding our organic Wheatgrass powder in a glass of H2O and to their daily juice or smoothie – delicious! Having the capsules on hand, help make your good health accessible when life is on the on the go. A simple yet usuer friendly idea is to have a supply of Mayella ® Wheatgrass capsules at your desk, in your travel kit or in your bag. 150 or 250 capsule sizes ensure wherever you go you can take your natural plantbased multivitamin and immunity boosters with you. 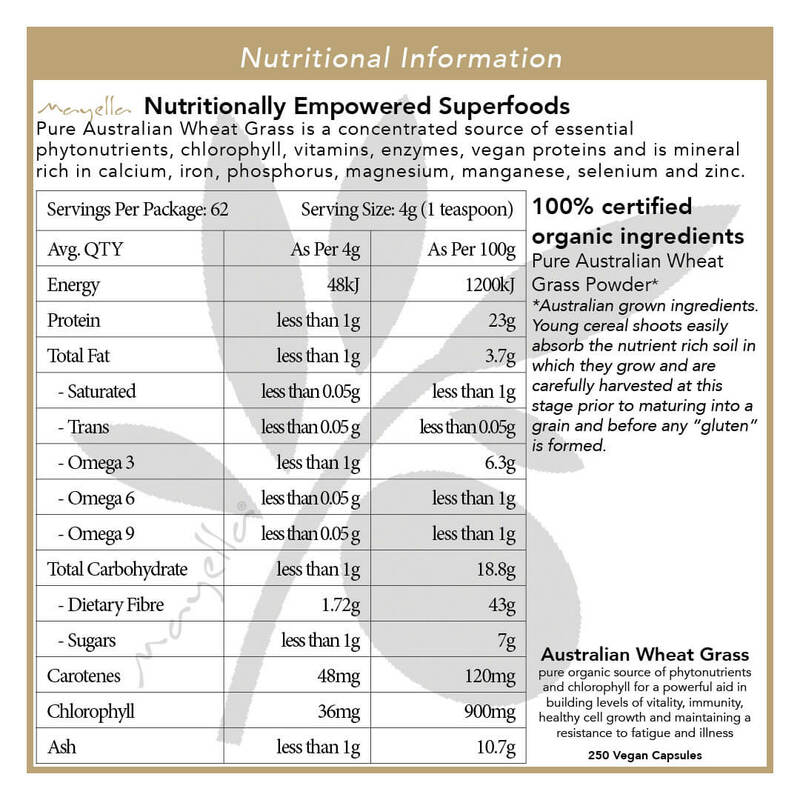 A pure organic source of Australian grown superfoods. Australian grown by default guarantees clean green unpolluted environment and pristine conditions nourishing and nurturing young shoots to an optimal age for harvest. Organic and ethical farming practices ensure with harvesting & specialised processing we are capturing maximum vitality and nutrient content. Every gram of Mayella ® Organics offers concentrated nutrition for optimised health & wellbeing in totally vegan, organic capsules and powders. Gluten Free, Dairy Free, palm oil free, GMO free, and no bulking agents, flavour enhancers, sweeteners or sugars at all. 100% grown, harvested and manufactured in Australia. 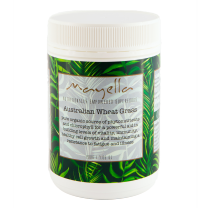 As a daily nutritional source, take 4-6 capsules of Mayella ® Australian Wheat Grass with a tall glass of filtered water, natural coconut water or your favourite fruit/vegetable juice. Morning or afternoon, with or without food is optional. Store in a cool dry place, below 30°C / 86°F. Wheat Grass* – The young green shoots of wheat grass are harvested at their nutritional peak prior to maturing into wheat grain and before any “gluten” is formed. High in chlorophyll, stimulating tissue growth and repair with over 90 minerals vital for life. Selenium contained in wheat grass is a powerful trace mineral and important in maintaining a resistance to disease, it is also known for increasing antibody production to strengthen the body’s ability to fight abnormal cell growth. High in iron assisting the body to transport and store oxygen in the blood and muscles, produce energy, maintain the immune system and is essential for fatty acid metabolism assisting the human body to detoxify and cleanse.